Finding the right steel building for your business can be a complex task; there are a number of considerations to bear in mind, with design and structural elements being just as important as the overall cost of the project. When you are looking to construct a steel building for your business, it is important that you are able to work with a supplier that you trust to deliver a top-quality structure. As well as cost, structure and design, businesses also need to consider a number of factors which will directly impact upon the working conditions of staff members who work in or use the industrial building - fortunately, there are a number of UK providers who are able to provide you with buildings and additional features that will comply with any requirements. If you are interested in finding out more about the various types of steel industrial building on offer, just continue reading; if you are ready to get quotes from up to 4 UK suppliers, you simply need to complete the form at the top of this page. What are Industrial Steel Buildings? Industrial steel buildings are not specific to any sector or area of business; indeed, as the name suggests, an industrial steel building can refer to a building that has been designed and built for any industrial purpose. There are a number of options included on this page. Industrial buildings are generally large capacity and more complex than some other options on offer. A warehouse or factory, for example, will almost always need to be a significant size in order to house whatever goods, equipment or staff need to be housed. The information and sections on this page should give you some idea as to what type of industrial steel building you might need. Find out more about agricultural steel building prices. Find out more about portal frame building costs. The functionality and features you require in your steel building will vary from business to business. The building you require will most likely need to match certain specifications - whether that be in terms of size, access or style - and so it is important that you make the right choice. 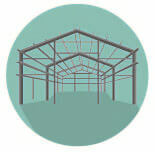 Most come in a cost-effective steel portal frame construction that features columns and rafters. According to a 2012 Construction Markets survey, more than 95 percent of industrial shed buildings in the UK use steel frames. Concrete and timber together accounted for less than 2 percent. The list below covers just some of the factors that you will need to bear in mind when purchasing and constructing a new industrial steel building. Building Height. Building height is one of the most critical considerations. Determined largely by the structure’s function, this also impacts ancillary accommodation requirements. The higher the building, the more costly the steel frame will be. Fire Protection. A fire-protection strategy is necessary for industrial units with mezzanines, internal offices or upper floors. So the design scheme should reflect the level of fire protection required. Location. Site configuration and constraints will affect both your design and budget. Most companies opt for an out-of-town complex or park, as the size and layout are better suited for industrial structures. Urban locations, like the city centre, are not as flexible and tend to be costly in terms of logistics. The factors above can influence your design, but for more specific factors and features, read the sections below. Compare Industrial Steel Building Options Today. For many businesses, a sturdy and safe storage facility is essential, which is why steel warehouse buildings are used across a range of industries. 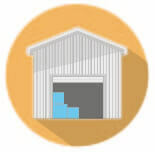 Most warehouses are used by businesses to store either products - whether that be manufactured goods, crops or some other mineral product - or to store equipment. Many warehouses are also multi-functional, providing business owners with space to store both equipment and goods. If you are looking to construct an industrial warehouse for your business use then you are likely to already know what its purpose will be - if this is the case, then you should have some idea as to what size and features you will need to include. A business can expect steel warehouse prices to be higher than those found with some other building types. Warehouses tend to be much larger than other industrial steel buildings and so you will need to pay for more material at the very least. The list below includes some approximate warehouse costs - these costs do not necessarily include additional features. As mentioned, the prices above are approximate. The cost for a large bespoke warehouse is based on the need for extras like insulation and cladding. Fill in the form at the top of this page to get definitive cost estimates from top UK suppliers. Steel factory buildings are a popular choice for a number of businesses for a number of reasons - they provide the resilience and durability found in more traditional building materials, but they do so at a fraction of the price and can be installed and constructed in far shorter amounts of time. Although some of the other prices on this page might be good indicators of what a business could expect to pay, it is more likely that factory buildings will be more complex - and therefore more expensive - than most of the other options. The best indicator of how much a steel factory might cost can be found in the section above. A large bespoke steel warehouse is probably closest to the specification so far encountered. 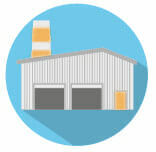 Because factories will need to house staff, products and probably equipment too, they are generally required to be both large and fit for use; this will generally mean that they require features - air-conditioning and windows, for example - that may not be needed with warehouses or storage facilities. The cost of your factory building will depend on both the size and functionality required; the more equipment needed, or the more people that the building needs to fit, the more it is likely to cost. Fill in the form at the top of this page to compare quotes from top UK suppliers today. Save by Comparing Industrial Steel Building Options Today. Like the factory buildings above, commercial buildings will require additional functionality that will depend on the size and type of building. As above, if you know what kind of functionality and size you need your steel commercial building to be, you can estimate the price using the information on this page. However, because commercial buildings come in so many varieties, with so many different features to consider, it is better to ask an expert. Are you looking for a cost-effective garage unit that can be set up in no time and requires little maintenance? Then a steel construction could be just what you need. Used for small businesses, residential and even industrial applications, steel garages are usually prefabricated. This means the components are manufactured in a factory and then transported to the site for assembly. Options vary from the basic carport kits to upscale units with workshops. Features such as special doors, windows and lighting are incorporated on request. The panel style and paint colour can be customised as well. How Much Does a Steel Garage Cost? Material and labour costs as well as the garage’s size and configuration all influence pricing. Small single-door units are the least expensive. Made of lower-grade steel, they provide less insulation than their mid-range and high-end counterparts, which tend to be more energy-efficient. For garages with steel cladding and anti-condensation coating on the roof, quotes start at £2,500 for a 5m by 2.5m single-door unit. Two-door versions measuring 6m by 6m cost approximately £4,000 and 6m by 10m units with three doors are at least £12,000. Rates are generally higher for garage workshops. Units with one roller door range from £5,000 (6m by 6m overall size) to £15,000 (10m by 20m). Their two-door counterparts can cost from about £7,000 (5.4m by 9m) to more than £12,000 (8m by 18m). Eaves height can impact prices as well. A 3.6m by 7.2m unit with a 2.4m high eaves and two bays is close to £3,500. At £12,500, you can get a 9m by 18m three-bay structure with eaves up to 3m high. For more information, visit our steel frames building prices page. Steel garages have many advantages at the outset but are also beneficial in the long run. You will spend less on steel units. For one, they are priced lower than wooden garages. Over time, they will prove to be cost-effective since minimal maintenance is required. You don’t have to wait long to see your new garage up and running. Because they are pre-engineered and have little internal support, steel units are quick to assemble with expert assistance. You can have your steel garage panels, doors and windows customised to fit your property and requirements. You can even request that a specific paint colour be used or lighting be installed. You can use steel garages for 20 to more than 30 years. Steel is an inherently strong, long-lasting material. Plus, it is resistant to rotting, damage and fire. You can reuse a steel unit or recycle its components for a different construction project if you are no longer using the original unit as a garage. You may encounter some rusting due to condensation and this can damage even your tools. This is why it’s important to pick units with anti-condensation coating on the walls and roof. Steel garages are the fastest and most economical solution for your vehicle and tool storage needs. Priced according to size, type and complexity of design, and grade of steel, these units are secure, durable, easy to maintain and can be reused so you’re assured that you are getting your money’s worth. Compare Industrial Steel Buildings Quotes to Save Money Today. Running out of storage space can be a costly and frustrating experience. Hiring external space costs money and the transportation and labour expenditure to get things to and from it can be costly. This is all the more frustrating when you have plenty of space in which to store things but no building to put them in. Luckily there are many options available to those looking for extra space with steel buildings being among the most cost-effective solutions; as an added bonus, they are also easy to acquire and install. The type of steel storage shed you’ll need obviously depends on the amount of storage space you need, how permanent you want the structure to be, and your budget. For storage of tools and equipment for a home or small business, a prefabricated, flat-packed, DIY shed as available from home and garden centres is probably the best choice. These are available in a variety of styles - corner shed, lean to, open ended, etc. - and in sizes up to around 7m by 4m. They normally take two people to assemble and most outlets will deliver within a couple of weeks. If you’re looking for a temporary storage solution, for example if you’re renovating your home and need somewhere to store furniture for a few months or if you expect a temporary stock surplus, a storage container could be an ideal solution. They come in standard sizes of 8 feet in width and 10, 20, 30 or 40 feet in length. Suppliers can deliver the containers to almost anywhere with a hi-ab - a truck with an attached crane. These containers can be fitted with high grade padlocks, lock covers, ventilation and anti-condensation coatings for dry, secure, vandal-proof and weatherproof storage. You’ll normally need to rent the container for at least a few months at minimum. If you need a larger, permanent structure for agricultural or industrial purposes, a prefabricated steel building is a strong option. These are available with roller-shutter doors, windows, skylights, personnel doors, insulation etc and come in an almost infinite variety of shapes, sizes and configurations. Suppliers will provide designs to match your specifications, help you with the planning applications, fabricate the building at a factory, deliver it and even manage the groundwork and construction. The range of industrial steel buildings available can make it difficult for business owners to decide exactly what they need. Fortunately, steel building suppliers can help you to make this decision. To get quotes from top UK suppliers, simply complete the form at the top of this page. Approved Index’s quote comparison service is free, quick and easy and it will ensure you get a great deal on your purchase and construction costs.